2 Kiltra is a lovely detached house situated close to the village of Wellintonbridge just twelve miles from Wexford and can sleep ten people in three ground floor double bedrooms, one with en-suite and two further double bedrooms. There are two family bathrooms and a separate cloakroom. Also in the house there is a kitchen with dining area and two separate sitting rooms both with woodburners. Outside there is ample off road parking and large gardens with furniture. 2 Kiltra is a superb house to be used as a base for exploring this beautiful part of the country. The parish of Bannow lies within the sleepy village of Carrig-on-Bannow and lies East of Bannow Bay on the south west coast of County Wexford. Oil central heating with woodburners. 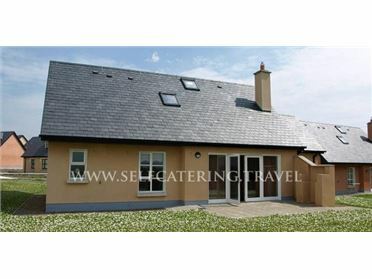 Electric oven and hob, microwave, fridge/freezer, washing machine, tumble dryer, dishwasher, 2 x TVs with Saorview, WiFi, selection of books and games. Power and starter pack for stoves inc. in rent. Bed linen and towels inc. in rent. Ample off road parking. Front and rear lawned garden with furniture. One well-behaved pet welcome. Sorry, no smoking. Shop and pub 2 miles walk. Note: There is wheelchair access to the rear of the property, please enquire should you have any specific requirements. Note: Oil is by meter reading. First hour is free and it is 2 Euro an hour after that..